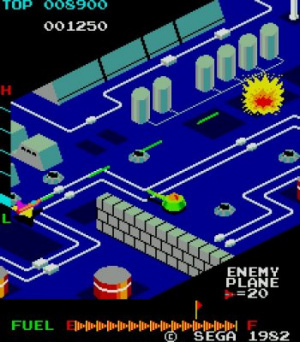 The original isometric 3D shooter! After bumper crops of WiiWare and Virtual Console titles on the Wii in Japan recently, this week will only see one for each service. 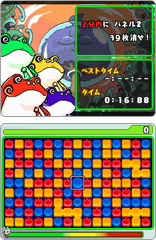 The DSiWare service, however, will have a fairly typical seven releases to choose from. Phoenix Wright: Ace Attorney (900pts - Capcom) - Everyone's favourite trial lawyer debuts on the Wii! This appears to be the first four chapters of the initial DS release with the fifth chapter to be released next March as DLC. Zaxxon (500pts Arcade - Sega) - It wowed with the novel 3D isometric perspective, but this game also got a lot of criticism back in the day, because this flashy new perspective - combined with loose analogue control - made it pretty difficult to play. Available at a budget price for VCA titles in Japan, it will nevertheless be welcomed by many nostalgia buffs. Shashin de Kakutoo! Photo Fighter X (200pts - Nintendo)-- A goofy-looking app where you take photos of yourself and your friends to insert into a fighting game. You can store up to eight fighters, using the DSi camera to take photos of various poses (there's outlines to help you with poses) and the microphone to record sound effects. Single or two-player local play is also promised, with each player using one side of the DSi controls. Looks like the this title will benefit from the larger size of the LL screens for easier posing and the bigger form factor for playing against other person. An amusing way to pass the time, but possibly not the next Street Fighter II! G.G. 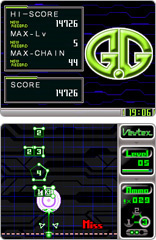 Series: Vertex (200pts - Genterprise) - Another bargain title from Genterprise. This one looks like a puzzle game where you're shooting to either eliminate polygons on a grid or to create them (number of shots relates to the number of vertices). It's a little uncertain at the moment but at 200 Points, how hard can it be? Renjuku Kanji Shoogaku 1 Nensei (200pts - I.E. Institute) - Still more educational titles from our friends at I.E. Institute! This is a beginning kanji program for helping primary school kids practice their first-level kanji. Artist ni Narou! Minna no Nurikai Inu Hen (500pts - Ertain) - The previous entry from last week, Artist ni Narou! Minna no Nurikai Shokyuu Hen, was an introductory colouring program containing several colouring subjects. This one is all about dogs. What seems to be missing is a black velvet colour-by-numbers look, but hopefully that will be contained in a future release. Rotating coloured blocks hyper fighting! Atelier Deco La Doll (500pts - Starfish S.D.) - This is basically a virtual paper-doll program where you can dress your doll in different clothing styles and then apply colour, stickers and frames. Chibi Joonen no Mahoo Daibooken (500pts - Gameloft) - Regular readers will remember this title as Castle of Magic, one of very few original platforming games for the DSi download service. Panewatsu! (500pts - Jupiter Corporation) - A puzzle game in which you rotate groups of coloured blocks to create chains or groupings, etc. Man, they got Photo Fighter. I hope it comes to NA. Still get Phoenix Wright: Ace Attorney if it hits Europe, even if it's a lazy, lazy, lazy port. I wonder if any of these titles like Photo Fighter or the Phoenix Wright on WiiWare will reach the US. Japan gets lots of things before us so it's not surprising. But I never played any Phoenix Wright so it's no big deal to me. "This appears to be the first four chapters of the initial DS release with the fifth chapter to be released next March as DLC." CapCom just seems to keep missing the point in the how and why of DLC... And this one is very, very wide. I'm surprised there weren't 30 more Namco arcade titles confirmed. Ugh, Zaxxon. I can't stand that game. They can keep that one. Zaxxon for nostalgia buffs. I am a buff. Zaxxon is fun, but has a definite learning curve that will lead people to utter a lot of swear words the first few times they play. Use your bullets to gauge your position. I got two versions of Zaxxon already, so I have no personal interest in this one, but give it a try, people. I think Photo Fighter might be fun for on;y 200 points. The games are hitting here in January, March, and May for $10 each but the full versions of the games in Japan are 1200 points each so I think we're getting the better deal here. Considering the fifth case is the ONLY DLC between the three PW WiiWare games and considering that Capcom wants to charge it for 100 points outside of Japan and considering that the fifth case was a bonus case to begin with, I think I can let it slide. Would love to try Zaxxon. To you guys wondering about PW, it's coming January 2010. NOOOOOOOO!. I WANT PHOENIX WRIGHT! Nothing really catching my eye here. Zaxxon is a super classic of Sega ! The biggest problem I had with Zaxxon was that bloody flight stick. It wasn't great quality to begin with and would often be broken. Even when it did work, you'd be overcompensating or drifting all over the place. With a modern analogue joypad I'm sure it will be a much better experience. I know I didn't really enjoy the game until I played it with MAME.